Are you prepping your home for the colder weather? With fall upon us, we faced the sad reality that it was time for us to close up the cottage for the season. 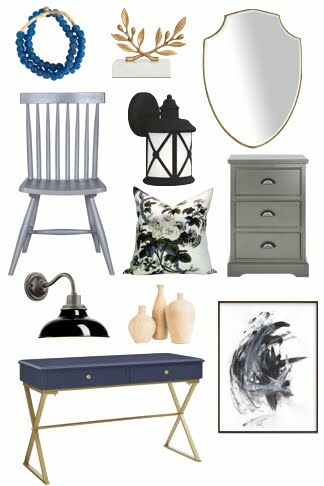 That meant finding a more permanent home for all of the things we've been storing temporarily under the cottage like our tools, beach chairs and cooler. It was time to build a shed. 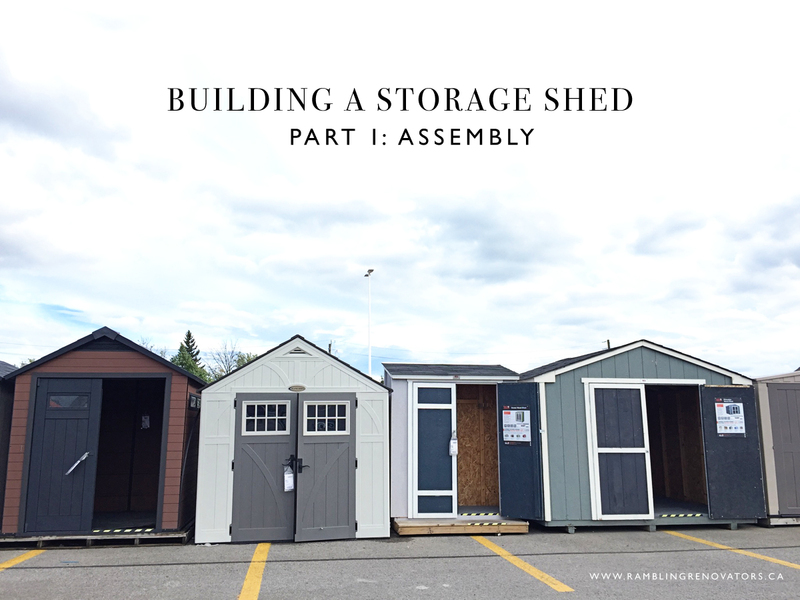 We headed to The Home Depot Canada to check out their sheds in person. We had three must-haves on our list: a shed with a small footprint, with a lean-to roof, in a style that would suit our cottage. 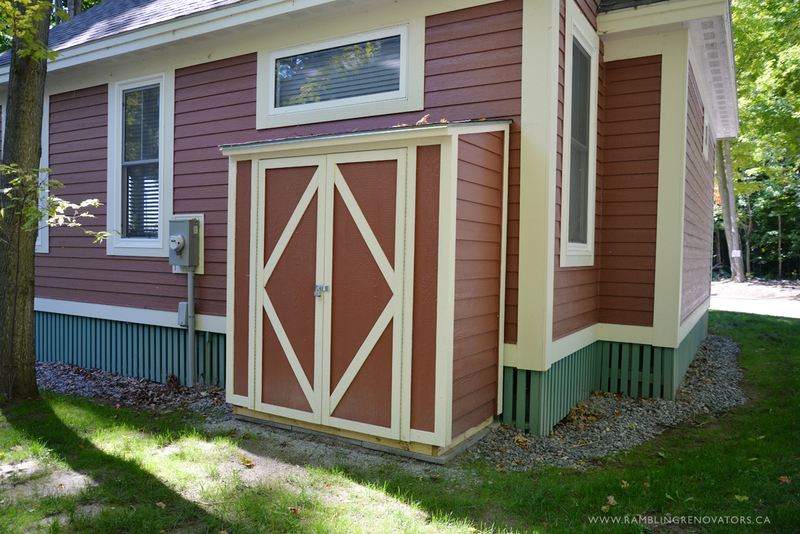 The Ocoee Wood Shed fit our criteria except for the style but we had some ideas on how we could customize it to get the look we wanted. 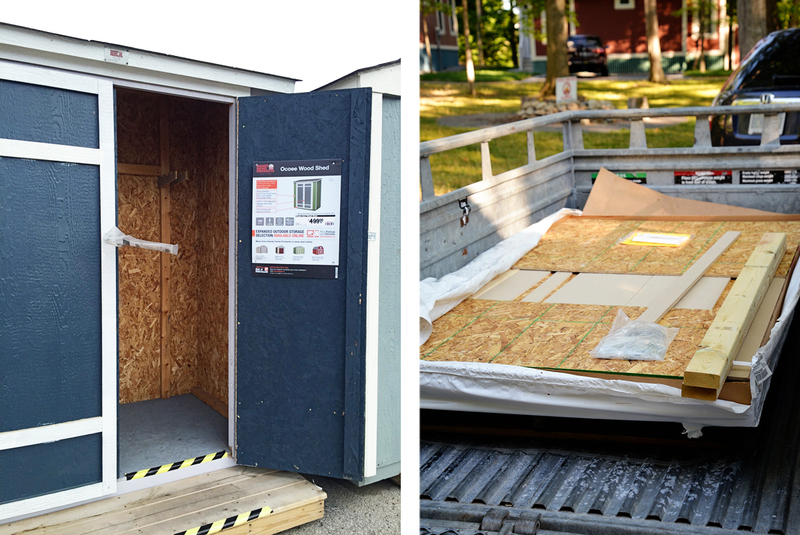 The shed came with everything we needed for the build including nails, door hardware, and trim. Shingles for the roof and paint were not included. Some of the parts were pre-assembled, like the pre-hung double doors, which made for a very large package. 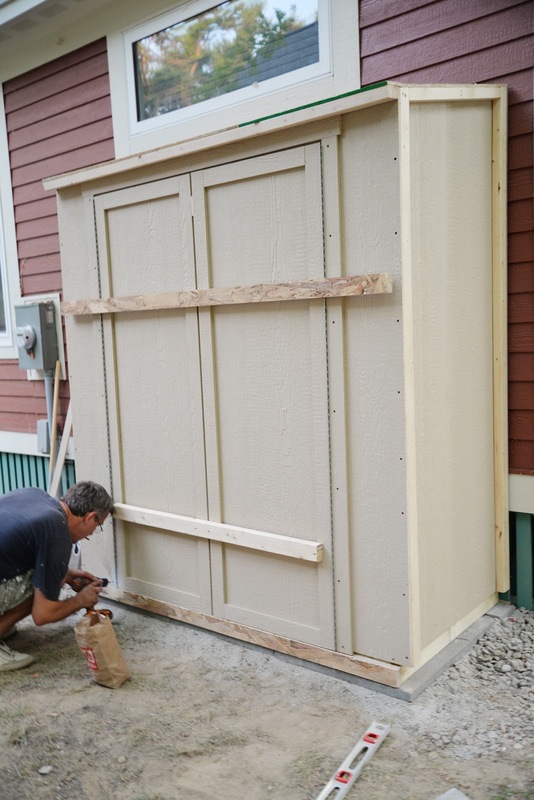 We had to rent a utility trailer to transport the shed so that's a cost to consider when you're shopping for a shed. The first step is to lay a foundation for the shed. Since the grade was level and we were dealing with a small structure, we went with inexpensive cement pavers as our foundation. Sean first levelled out the existing pea gravel surrounding the base of our cottage, then placed and levelled the pavers, and finally placed the preassembled base structure on top. The building of the shed was fairly easy (says the girl who went swimming at the pool with Chloe while Sean actually built the shed). Instructions were clear, including helpful tips like where to place braces. Sean assembled and built the shed on his own in about three hours. The structure itself felt strong and stable. Angles were square, doors lined up, and the semi-finished product looked quite good. We were very happy with the quality of this shed. 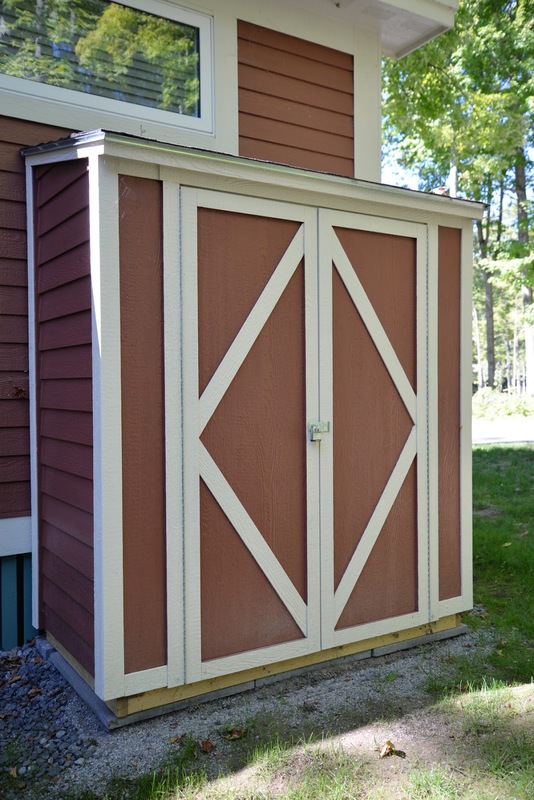 At this point, you have the option of painting your shed and adding on the trim that is included in the shed kit. We decided to add custom touches to help the shed blend in with our cottage. 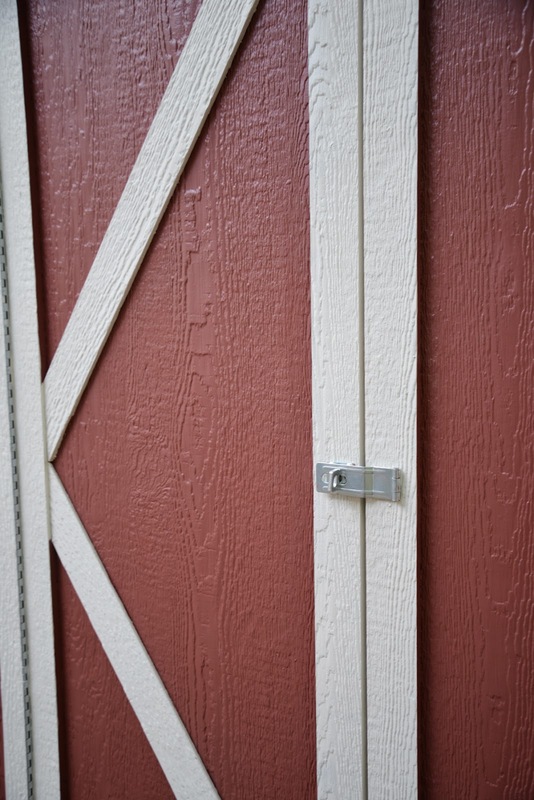 Our plan was to add siding on the sides of the shed and a trim detail on the front to give it a barn door feel. Sean has done enough DIY projects to know to look for ways to make the job go faster and easier. Since there was lots of siding to be installed and each piece needed to be equally spaced, Sean built a jig to help with this task. 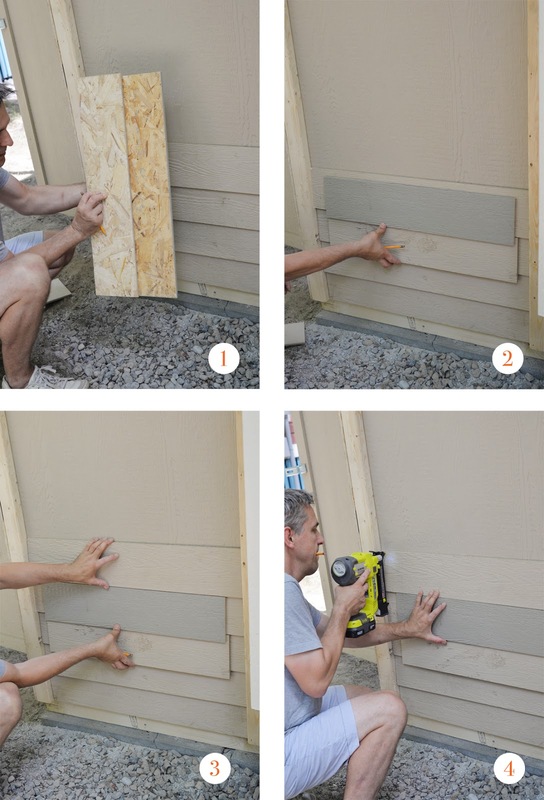 Step 1: Determine how much overlap you want between the pieces of siding. Take two scrap pieces of siding and overlap them by this amount (we used 1"). Ensure the overlap is level and glue the two pieces together to create a jig. 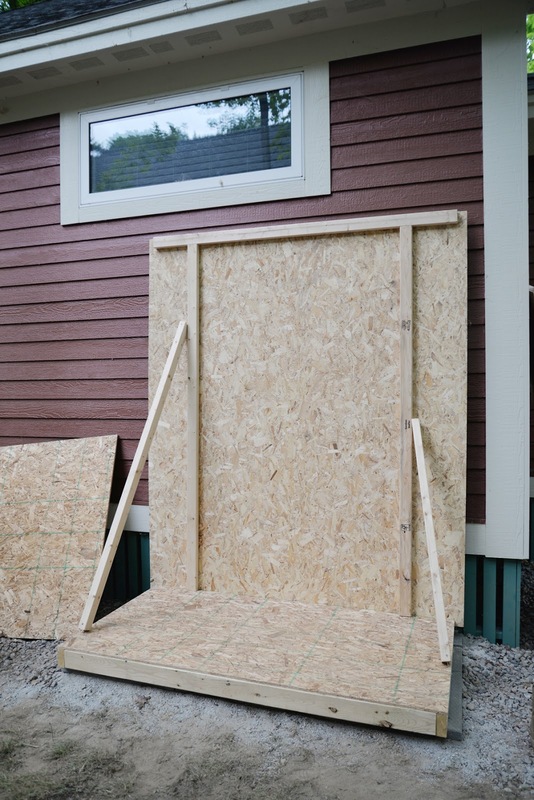 Step 2: Place this jig against the siding. Step 3: Place your next piece of siding atop the jig. 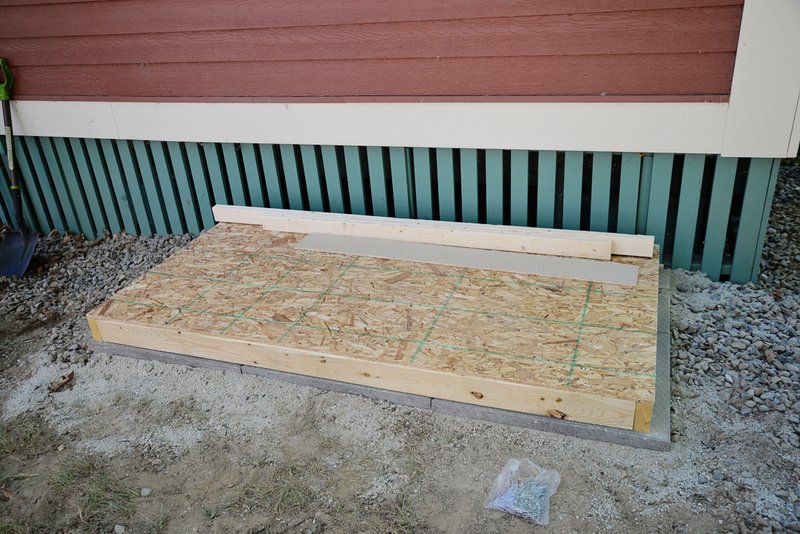 The siding now overlaps the bottom piece by your chosen amount. Step 4: Nail the siding in place. Sean managed to get a third of the siding installed before the end of the day. The next morning, he quickly finished installing the rest of the siding. He then added shingles to the roof (the shed used one bag of shingles). Finally, he used a paintable exterior sealant to fill in all the gaps and nail holes. We were thrilled with how this project turned out. 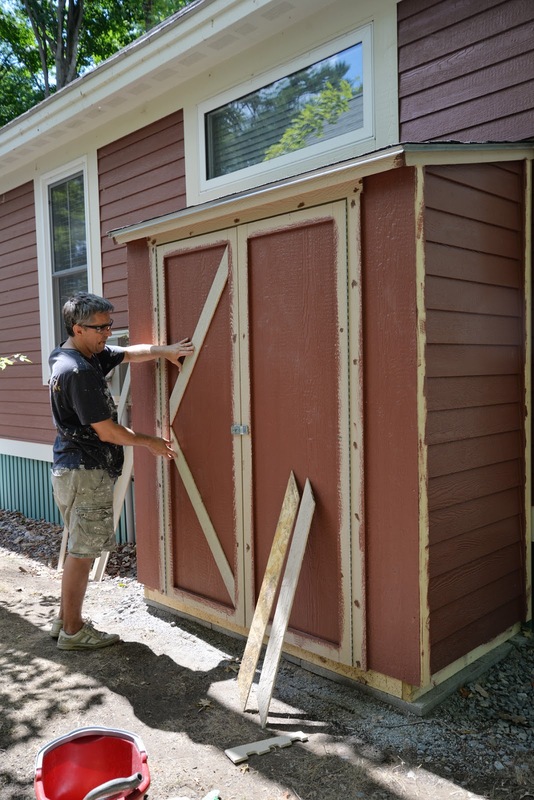 The shed looks like it has been there all along and it provides ample room to store our things. 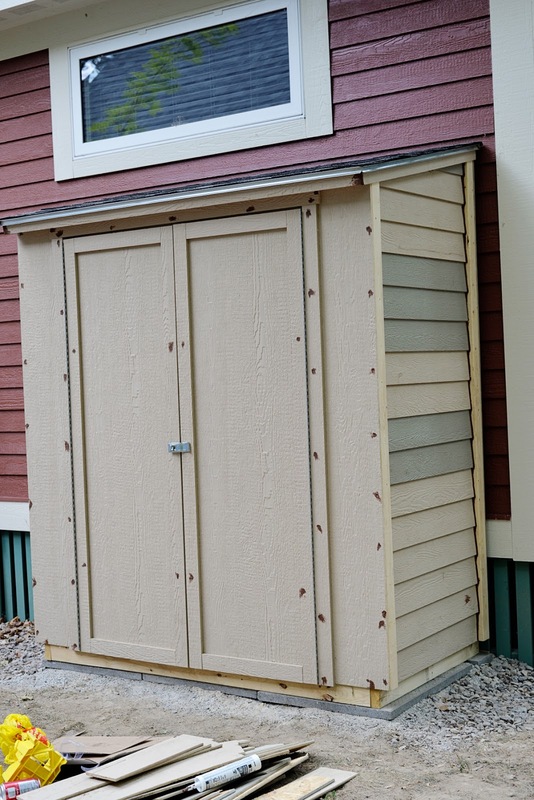 Now while this project might look finished, I do have some shed storage organization ideas to share with you soon. Sean is a bit fanatical about having an organized garage and this shed was no different. 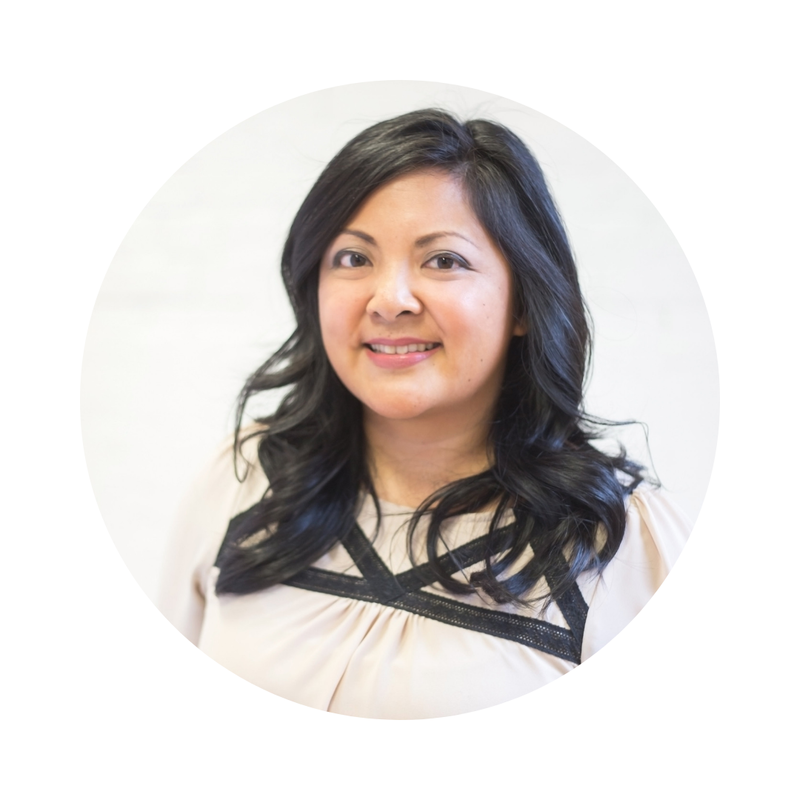 Can't wait to share our organization tips and tricks with you! 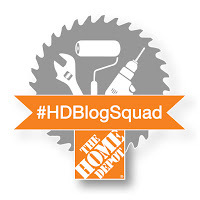 Disclosure: This post is sponsored by The Home Depot Canada. All expressed opinions and experiences are my own words.